A new Parks Associates report finds that smart home solutions will increasingly rely on voice control, video and data analytics, sound recognition, and AI to simplify the user experience. 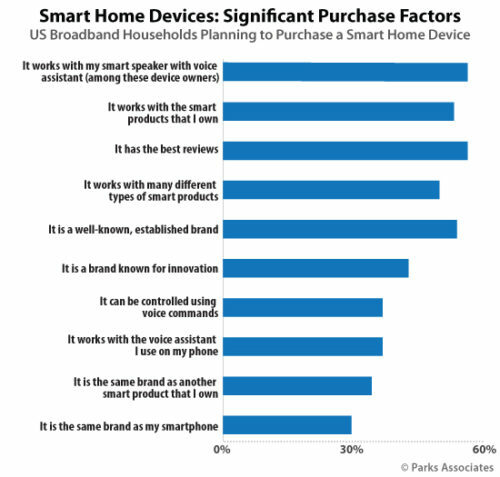 Technology Convergence and the Smart Home reports US broadband households now own more than 10 connected devices, including a mix of connected CE, smart home, and connected health devices, and as they buy more, they base their purchase decisions on a product’s ability to work with the existing devices in their home. Consumer interest in products supported with advanced analytics is strong—67% of consumers rate “alerts when someone enters your home,” a key video analytics capability, as the most appealing among a range of home security features. 75% of US broadband households want to keep tight control over their personal data, and 45% are “very concerned” about hackers gaining control of their connected devices.